Why are Activities Important to Residents? In-Service training is vital for all staff member to participate in. This type of training allows all staff members to become familiar with any changes in the facility and the opportunity to share their feedback. 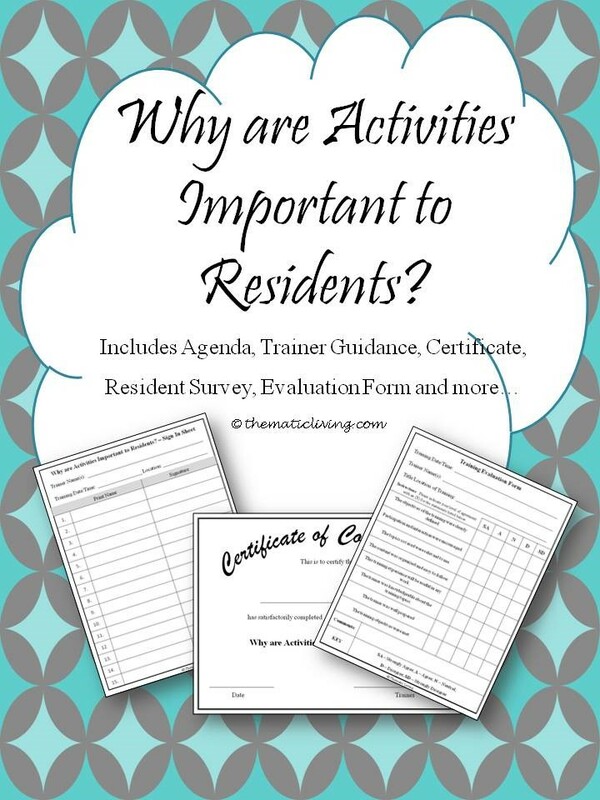 This training was created to help staff of the Activities Department and other departments to get a better understanding of why activities are important to our residents. It also teaches how staff can change their perspective and walk a mile in the resident’s shoes to fully understand how residents may feel as a member of their facility. This training can be modified to take place over 15 minutes, 30 minutes, or an hour depending on what you want your staff to know and how much time you have to complete the training (including discussion activities). This training can take place on a regular day of your choice or you can make the training coincide with a special day or event, such as: National Activities Week, National Activity Professionals Week, etc. This training topic is so important for all staff to know, you may want to add some or all of it to your orientation process that you currently have in place for new staff members and volunteers. You could also modify the training so that you can share with family members as well as the community “Why Activities are Important”.